Dish up the correct number of servings onto the plates in the kitchen. â€“ When I was growing up, my family used to just bring a huge bowl of spaghetti noodles and another huge bowl of spaghetti sauce to the table. The bowls would be passed around and we could choose how much of each we wanted. Now that I have mastered healthy eating, we dish up all the food in the kitchen and bring the individual plates to the table. I found that serving a meal â€œFamily Styleâ€ is too much of a temptation for me. I tend to take too much in the first place and go for seconds afterward. Dish up the leftovers into individual sized portions. â€“ I use Ziploc Storage Containers because they are inexpensive and translucent enough to tell what has been stored in them. If the recipe says that it has six servings, I get a dish for me, a dish for Mike and four Ziploc bowls. I divide the recipe equally among the six dishes and put lids on the containers before taking our dishes to the table. Leave the leftovers in the kitchen. â€“ If the leftovers (in their individually sized containers) are in the kitchen when I finish eating. I am reluctant to get up and dish up another serving. I would have dirtied a dish (and lid) for nothing and thatâ€™s one less lunch for me over the week. If you want to truly be committed to only eating one serving, put them in the freezer before you eat your meal. I guarantee that the idea of that same meal, growing ice crystals in the freezer will prevent you from overeating. Controlling the amount of food I eat has been an important factor in my weight loss success. Whether I am eating at home or at restaurants, managing my portions has been essential. I donâ€™t cook at home very often, but when I do, I find that these three tips prevent me from eating too much at home. The market is filled with tiny MP3 players that you can just wrap around your arm and take with you on a run or to the gym. 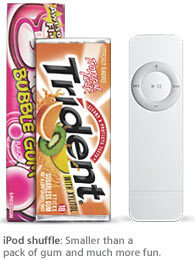 Microsoft has an article that seems to be in response to the iPod Shuffle, but the points they bring up are valid. They do a good job of explaining why the flash memory players are better than the hard drive players (such as the iPod). They fail to tell you that flash players are good because they are so much smaller than hard drive players. They recommend players that have a display, which I agree with. I really wish Apple had included a small, one-line scrolling LCD display on the side of the Shuffle. But then again, the Shuffle looks so cool. I personally use my Palm OS device with the MP3 player software that came with it. The songs are stored on an SD card and I can have hours of music at my fingertips. Not everyone is willing to trick out their Palm just so they can listen to tunes, so this guide may be of service to you. I’m Annoying – Shocking, Isn’t It? Last week, I came to the realization that I’m one of those annoying people who think exercise is fun. I felt that twinge of guilt because I have been subjecting my favorite people to continual talks about health, fitness and nutrition. This article makes me feel a little better. What I am feeling is a normal response to eating healthy and exercising regularly. The best part of this article is that it gives you a clear picture of what healthy living will feel like once you get to your goal weight and maintain it for awhile. Pull this article up each time you are lagging in motivation because it’s the closest thing to what being thin feels like I have ever found. I just saw this movie last night. The DVD has bonus materials that caught my eye. Specifically the â€œscientificâ€ mold test he did on fries and a burger from a restaraunt that actually makes their stuff fresh.. then he took the sandwiches and fries from McDâ€™s and put them all in a jar to promote mold growthâ€¦ the real burger & fries molded in about a weekâ€¦ the McDâ€™s fries didnâ€™t mold after 10 weeks.. the burgers were alient planets all by themselves by that time.. but it took a while. Point is. What are you actually eating when you eat their fries? I wouldnâ€™t even want to know. Iâ€™m sure all of us have performed a variation of this experiment w/out even knowing itâ€¦ you clean out your car and discover some fries that missed your mouth that have fallen under your seat â€¦ God only knows how long itâ€™s been there.. but looks as perfect as the day it was purchased. NO biological breakdown or mold at allâ€¦ makes ya wonder what youâ€™re really eating. I, for one, will never eat fast food again. You said, “I, for one, will never eat fast food again.” That is just the kind of thinking that can send some people into a purge/binge cycle. If I told myself that I could never eat fast food ever again, I would follow that rule to the letter… for about three-four months (I’ve tried this before, I know my limits). After three to four months of DENIAL, I would end up bingeing on fast food and end up eating far more than I ever would have if I had told myself that I could eat at fast food restaurants whenever I wanted. Given permission to eat whatever I want, I tend to choose healthier options than if I tell myself that I CANâ€™T have something. What we should focus on is being healthy. Which is healthier? Restricting something from your diet until it becomes the only thing you can think about and bingeing on it beyond comfort. Allowing small quantities of unhealthy food into your diet tempered by healthy food most of the time. In my case, I have found that allowing myself permission to eat whatever I want paradoxically helps me eat less. It has been the method that allows me to eat healthier than I ever have in my entire life. Iâ€™m not young enough to buy the kidâ€™s meals and Iâ€™m not old enough to buy the Senior meals. You know what? Ninety percent of the time, my server doesnâ€™t care. 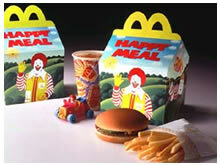 If you are polite and order nicely, they will give you the kidâ€™s meal or the senior meal ninety percent of the time. Itâ€™s the other ten percent of the time Iâ€™m talking about. Fast Food Option: Order the meal To Go and tell your server that your child/grandmother is in the car. Iâ€™ve only had to use this option once. I was at Wendyâ€™s for lunch. After she said that the Kidâ€™s Meals were only for kids, I told her it was To Go and that my child was in the car. She shrugged and gave me the Kidâ€™s Meal even though I didnâ€™t order anything else. Iâ€™ve had this work once. I donâ€™t mind paying extra in order to keep myself from eating too much. Another time, I ordered the childrenâ€™s portion, but the waitress brought the adult portions to me. I called her back and sent half the food back with her on her tray. The third time I tried this, the waitress wasnâ€™t willing to help me, so she got an insignificant tip. Remember, we are the consumers. We drive the market. If we ask for smaller portions often enough, the restaurant business will scramble to create healthy and delicious meals for us that are meant to serve one person instead of three. Additionally, the employees of restaurants arenâ€™t paid enough to REALLY care about the rules. Ninety percent of the time, I order the Kids/Senior Meals without anyone saying a word or raising an eyebrow. They just want to get me fed and out of their place quickly and the path of least resistance is giving me what I want. Try it. It works for me. Controlling the amount of food I eat has been an important factor in my weight loss success. Whether I am eating at home or at restaurants, managing my portions has been essential. Ordering from the Kid/Senior Menus is just one way Iâ€™ve been able to keep my portions manageable. Shape magazine has what they call a boredom busting workout that is supposed to break you out of your physical fitness rut. After looking over the program, it looks like a fairly easy plan to follow. You will need dumbells in a variety of weights, a weight bench and a stability ball. The cardiovascular training can be done on any cardio machine. In all, this program is best used at a gym where you have easy access to all the equipment and the variety of different cardio machines. As far as navigation goes, Shape’s web designers could have done a better job. Make sure you read the side bar on the first page about RPE (Rate of Perceived Exertion). It isn’t discussed on the first page, but is used heavily in the cardio section. Additionally, you could use a Heart Rate Monitor instead of RPE. When I heard that Adidas was making a tennis shoe with a built-in microprocessor, I got really excited. At first, I thought it could be something to gauge my mileage and speed. Maybe it could even monitor my heart rate. It could at least tell me if I’m running too slow to finish the race on time, right? No, that would make too much sense. Instead, the microprocessor automatically senses the environment and whether you are running and walking and adjusts the springiness of the shoe to match it. I’m feeling a rant coming on, but I’ll just say that I don’t need that. The running shoes that I have right now are perfectly springy without a microprocessor. Since the Engadget review didn’t make it clear, I had to sit through the tiresome animation at the Adidas 1 website to make sure that it didn’t actually have some useful features like pace monitor or GPS tracker. A stopwatch might have been helpful too, but it doesn’t seem to have even that. At the cost of $250 a pair, you could buy a cool pair of running shoes and a GPS tracker. That’s the computer/shoe combination that I would recommend. The concept of Mini-Meals is a two-edged sword. Eating five to six Mini-Meals each day is an effective way of keeping you feeling full and preventing your blood sugar from dropping. If the meals start inching away from the mini size, however, you have the potential of eating more calories throughout the day. Keeping your Mini-Meals mini is the key to this technique. The way I keep my Mini-Meals small is that I only snack on fruit and vegetables. They are so low in calories that they balance things out if I happen to overdo it a bit at dinner. I donâ€™t recommend making your breakfast smaller. When I eat a well-rounded breakfast with enough protein to keep me satisfied, a snack between breakfast and lunch can stay small. I usually space my Mini-Meals about two to three hours apart. Sometimes that makes me feel like Iâ€™m eating all day long. When I first started dieting, it felt really comforting to know that I only had to wait two hours until my next snack. Now that I am eating healthy on a regular basis, I am used to the Mini-Meals. I donâ€™t get hungry between them, but they are a nice break in my day. I usually choose one or two from the above list for my snacks between breakfast, lunch and dinner. If I have two snacks, I choose one vegetable and one fruit so that I get a wider variety of nutritional value. Remember, a serving of fruit or vegetables is only a half cup. It is recommended that you eat five servings a day. If you eat two for your mid-morning snack and two for your mid-afternoon snack, you’ve polished off four servings. Controlling the amount of food I eat has been an important factor in my weight loss success. Whether I am eating at home or at restaurants, managing my portions has been essential. Mini-Meals helped me learn how satisfied I can be with smaller portions. Once again proving that obesity and poor nutrition are not the same problem, Tech Central Station interviews two people who ate McDonald’s food every day and still lost weight. Tech Central Station – 30 Day McDiet: Results Are In – by Ruth Kava, Ph.D., R.D. This article is a rebuttal to the entertaining, but scientifically flawed “Supersize Me.” I finally saw that movie a few weeks ago and I’m so glad that I don’t have to eat McDonald’s food every meal of every day for 30 days just to prove that I could lose weight. Two other people did it for me. Of course, nutritionally, McDonald’s food did not provide them with some nutrients and oversupplied them with saturated fat and sodium. That is poor nutrition, however, not obesity. If Murlock removed all references to obesity in his movie, it wouldn’t be nearly as compelling. I’ve held some strange nationalistic pride in what I considered the ever-growing life expectancy of Americans. Ever since I was a child, I have been told that because I live in America, I will live longer. Because they invented antibiotics, I will live longer. Because our medical care is the best in the world, the life expectancy of all Americans is higher. That may no longer be the case. This article talks about the Social Security debates that are raging here in the United States. The Social Security officials have based the life expectancy on past performance in the U.S. and expect their citizens to live to their mid-80’s later in this century, but a group of concerned health experts warned them about the obesity epidemic. Considering that 1 in 3 Americans is obese, the life expectancy ages may be lowered for the first time. Just as I felt a nationalistic pride before, I feel a shame now that makes me lower my eyes.